The Honda CR-V is a versatile SUV that delivers a dependable performance to everyone from commuters to families. So, what can the latest model offer drivers in Peoria, Glendale, and Sun City? We put ourselves in your shoes and decided to cover all the specs, subjects, and areas of interest that you're likely to take into account when you're thinking about which SUV you want to buy. 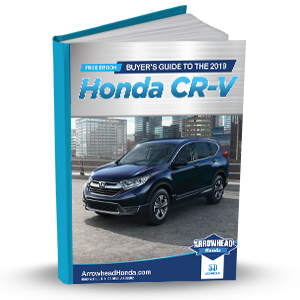 To get started, download our FREE eBook, Buyer's Guide to the 2019 Honda CR-V, to see everything this safe and stylish SUV has to offer. If you decide that it's the right vehicle for you, visit Arrowhead Honda and take a test drive. We offer a large selection of reliable Honda SUVs to drivers and families in Phoenix, West Valley, and Surprise.